Moody has extra ordinary linguistic skills. 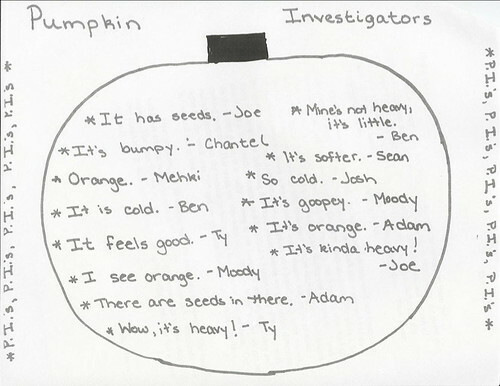 They had a pumpkin investigation in class this week, and one of his lines was "It's goopey!" This skill of his surfaced as early as 2 years of age. Sometimes he could be a pain in the neck though. Everything has to be called its proper name, and specific language has to be used. He keeps correcting people, starting with me; as if Sol is not doing enough of that--now, there is two of them. Yes, Sol is this way and more--I have to remind him frequently that not all people have the same level of intelligence, and that he has to give room for that... so far I haven't been completely successful, but making progress. Yesterday at lunch, I asked Moody to "eat your soup." He answered, "You should say drink your soup, not eat your soup!" And yeah, Tala is a highly absorbent sponge! I can't wait to take Moody to Libya and see how he interacts with people there, with them using general terms for everything to the point that sometimes you can't follow what they are talking about. Have you noticed how they would say "that thing... the other... the one... or ehnee (هني)." They rarely call things by their names, let alone people. It's the culture and also an indication of how much the new generations are lacking in proper education and directions. Finally, we're back on track with Moody. 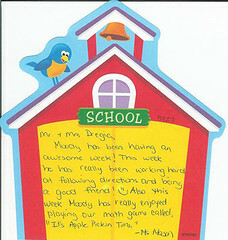 This week's note from Ms. Mason was a relief! He had an adverse reaction during and after his first therapy session, but I was expecting that. Introduce something new to him, and he goes bizarre... that's my boy! Oh, one more thing I have to mention. He was grumpy one morning (not that he's not most of the time he he) so Sol asked "what's up with him?" And I said "You're asking me! Ask little Sol!" 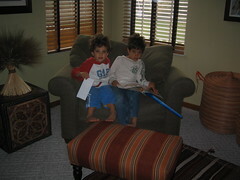 It's amazing how much alike they are... in so many ways, more good than bad! I'm just glad that he got all the brains his dad has, and some which comes from me. 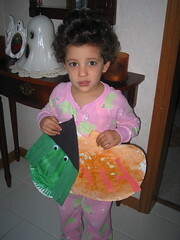 Here's Tala with the fall artwork she did at school. They don't call it Halloween anymore, to be politically correct! Just like they don't say Christmas season, but Holiday season instead. Public schools are very specific about that now and I like it. Actually, the first year Moody joined the school, we had a meeting with them after we had noticed that they do things that are symbolic of Christmas. Our point was that we don't mind if they expose them to all religions, but not just one of many. That year, Eid, Christmas, Hanukah, and Kawanza were around the same time, and we insisted that they either do it all or none. They listened (oh, how I love a free country!) and asked us to help them do something about Ramadan and Eid since they don't know much and don't have the material. We got children's books and have been holding Eid parties at class every year, with goodies for the kids and teachers and other activities. It is nice to feel that you're part of the big picture and that you matter--first time in my life! But where else could one experience that but the US! I drifted... Back to Tala, she's the sweetest, even her tantrum fits are so mild and sweet (have I mentioned this before?) Sol and I were talking about that yesterday, and I told him she takes after me. Not unexpectedly, his answer was "So, what happened to you then, where did your parents go wrong?" Arrrrr! lol. Seriously, I was that way, my parents always told me. I still am... in some ways. Last night was Home on the Range... not bad. Flubber is still on top of the list; Moody kept comparing the Professor to Sol and wondering if Sol does the same crazy experiments Professor does. Well I told him that all scientists are weird. It's true, I live with one! Weird but make life very interesting, fun, and worthwhile! - Savings in poor countries is 40 times all the foreign aid received throughout the world! - Egyptian poors have 55 times as much as the sum of all direct foreign investments ever recorded there! - Egyptian dead capital is $240 billion! 30 times the value of all shares in the Cairo Stock Exchange. - "By our calculations, the total value of the real estate held but not legally owned by the poor of the Third World and former communist nations is at least $9.3 trillion." $9.3 trillion is almost as much as the value of all companies listed on the main stock exchanges of the top 20 developed countries! A very good, eye-opener read indeed! A long week ahead of me. Sol is going away for 3 days; I still haven't found someone to stay with the kids during my classes at night! I have to finish setting up the Tibra Awards for this year which starts November 1! Trick-or-treating is Monday night; we were going to drive Sol to the airport, but we will miss the trick-or-treat then. I still have to decide if I would take the kids around or stick here and greet the trick-or-treaters. Guess I might do a little of each. I also have to prepare the Eid goodies for the kids' teachers and classmates. It seems you're having a lot of fun with the kids :) and Sol.